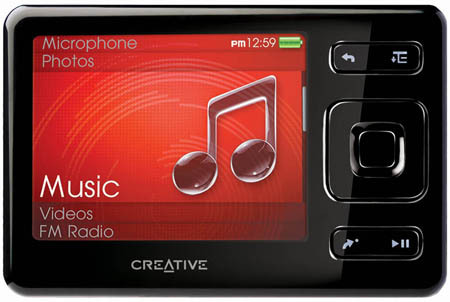 Creative has pre-empted Apple's anticipated announcement of a widescreen iPod Nano with a similarly spec'd tiny media player of its own. The new Zen is also Creative's first device to support AAC-encoded songs. 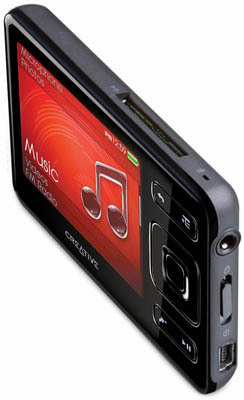 The 8.3 x 5.5 x 1.2cm Zen packs in 4, 8 or 16GB of Flash storage, ready not only for AAC tracks, but MP3, WMA and WMA DRM audio files; MPEG 4, WMV and DivX video; and JPEG photos, all rendered in the player's 2.5in, 16.7m-colour screen. And if you find the Zen you chose has too little memory for your needs, you can add more through the player's SDHC card slot. The Zen incorporates an FM tuner and the inevitable microphone. Creative claimed the built-in battery yields five hours' video playback or 25 hours' music listening. Apple's new Nano is believed to look like a shrunken standard iPod, albeit in a range of coloured cases. The iPod itself will take on the looks of the iPhone. Both are expected to be announced next week. Available soon, the Zen will be priced at £100 ($201/€147) for the 4GB model and £140 ($281/€206) for the 8GB version. The 16GB player's price has yet to be set. The Zen will be shown at the IFA consumer electronics show in Berlin later this week.